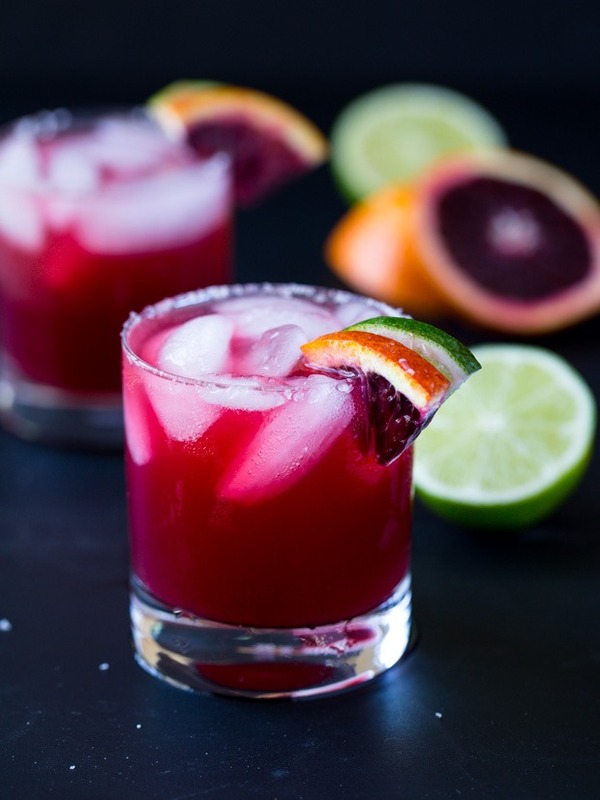 Skinny Blood Orange Margaritas are made with just four simple ingredients and are only 77 calories each. The delicious flavor and beautiful bright pink color makes them perfect for entertaining! Whether you wanted it or not, I promised you guys these were coming, and I am a woman of my word. 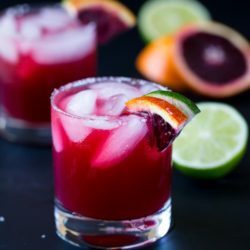 I’m aware that there are already TONS of recipes for blood orange margaritas floating around the internet but, being the hip-cocktail-drinker that I am, I just tried one for the first time a few weeks ago. Brandon and I went out for lunch at a new restaurant that recently opened nearby called Pacific Catch which, as the name would imply, serves mostly seafood. Thankfully they also happen to have an impressive selection of plant-based options and a mouth-watering drink menu to boot. 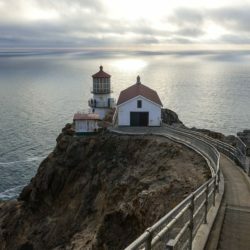 If you live on the West Coast or are ever in the area, you should definitely check it out! Anyways, one of the items on their seasonal menu was a blood orange margarita that I happily slurped down alongside a scrumptious plate of tacos with sweet potato fries. Between the beautiful bright pink color and the perfectly tart flavor, I fell hard for that margarita. The funny thing us, I’m not really a big margarita person. I usually shy away from ordering them because all of the sugar and acids in the margarita mix gives me terrible heartburn. But these were done right. They were made with fresh squeezed blood orange and lime juice then slightly sweetened with light agave nectar. I left there without a doubt that I had to recreate them for you! I’m calling them ‘skinny’ because I chose to leave out the agave nectar which makes them a super light option for a cocktail. Actually, I had to laugh because the nutrition calculator that I use for my recipes gave them an A-rating. That might be true in the world of cocktails but I wouldn’t say hard liquor is in any way nutritious! So with that in mind, they’re great if you’re trying to be conscious about calories while still enjoying an adult drink here and there. 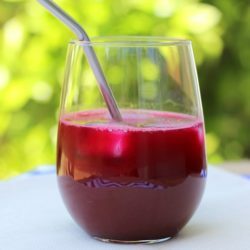 I personally thought the blood orange juice made them plenty sweet enough on their own but feel free to taste test and add a little agave nectar if you prefer. Combine all of the ingredients in a large pitcher then add the ice cubes. Stir well then pour the mixture into four glasses (with optional salted rim). 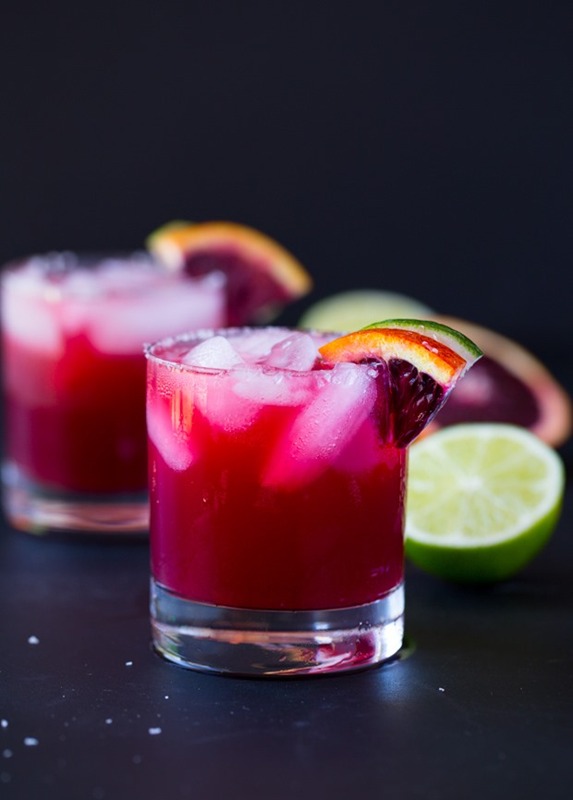 Garnish with lime and/or blood orange slices, serve cold and enjoy! If you would like to make these ahead of time, simply wait to add the ice to the pitcher until ready to serve. For a slightly sweeter option, try adding two teaspoons of light agave nectar. This looks delicious! I have never made margaritas at home, but it’s never too late! I love that you left out sugar and the agave too. Agave is actually horrible for you, it’s processed the same as high fructose corn syrup and usually not made from the agave plant either. Yeah, I’ve heard that about agave. I’ve been trying to use it less! 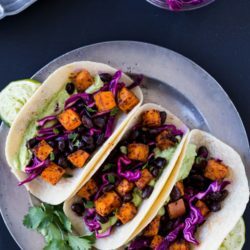 These look so good, Sarah! Our favorite Mexican place has really great marg’s that aren’t too sweet. My favorite are always David’s homemade and he doesn’t add sweetener. One of my favorite summertime drinks! I went to Pacific Catch once in Marin somewhere years ago, but I still remember their sweet potato fries. I wouldn’t mind trying one of their poke bowls! You really don’t need a lot of sugar for a good margarita. Hopefully you get to re-visit Pacific Catch one day. It’s so good! The COLOR of that drink is almost surreal. I love the simple cut slices on the glass rim that contrast with the color of the drink. The way you used a dark backdrop for the cut and whole fruit makes the objects being showcased really pop out. 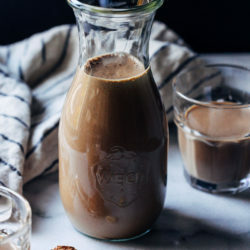 Really stunning photos…and the drink recipe is easy and doable! Thanks, it was a treat for my eyes to see this post this morning! Yummm!! I would totally enjoy this “healthy” treat haha. I do love a good margarita, but they’re so bad for you I hardly ever get them. This is perfect! I love margaritas but normally go for red wine because I’m picky about my cocktails and I’m always worried I’m going to pay $10 for something I don’t like! 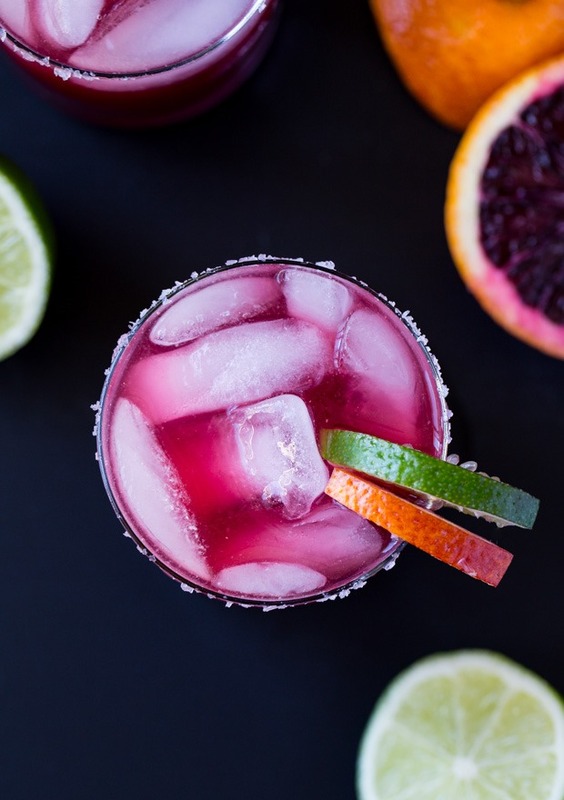 I have yet to try a blood orange margarita but I’ve been dying to try them. 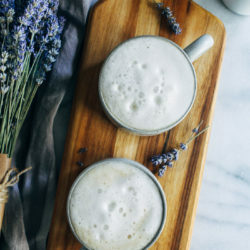 These are so pretty and I love that you used silver tequila (it’s a must for me)! So beautiful! Hey, if your calculator says they’re healthy, I’m going to go with that! haha an A rating for hard liquor – I like that!! Too funny. These margaritas look so so pretty and they sound fantastic! 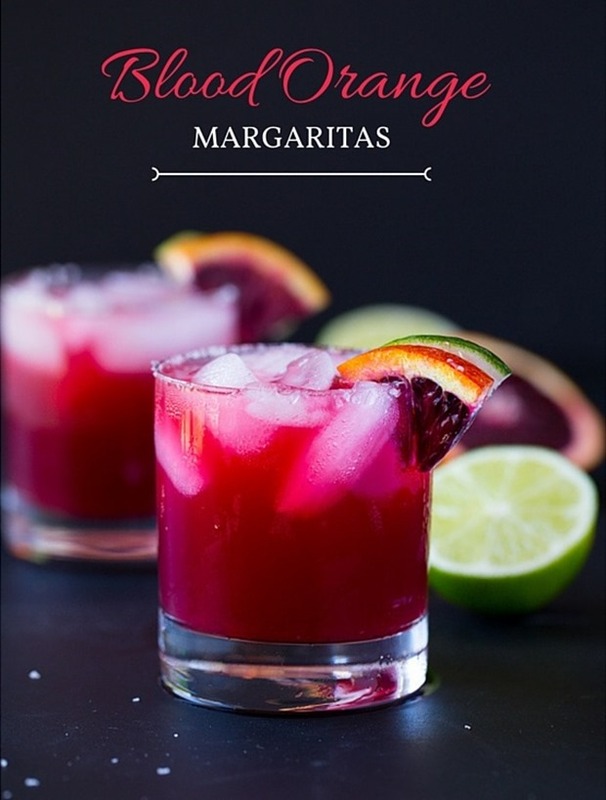 I’m not usually a margarita person since they are often so sweet … but this, this I could definitely do!! Goes to show that the nutritional calculator doesn’t always focus on the actual nutrition, right?! Aren’t they so pretty?! Thanks Beverley! I’m not a huge margarita person either (too sweet) or a huge alcohol person in general, but I HAVE to make one of these next time I whip up some drinks!! They’re oh-so-beautiful and seem like they have just the perfect amount of sweetness. Wow!! These are so beautiful! what a fun recipe. 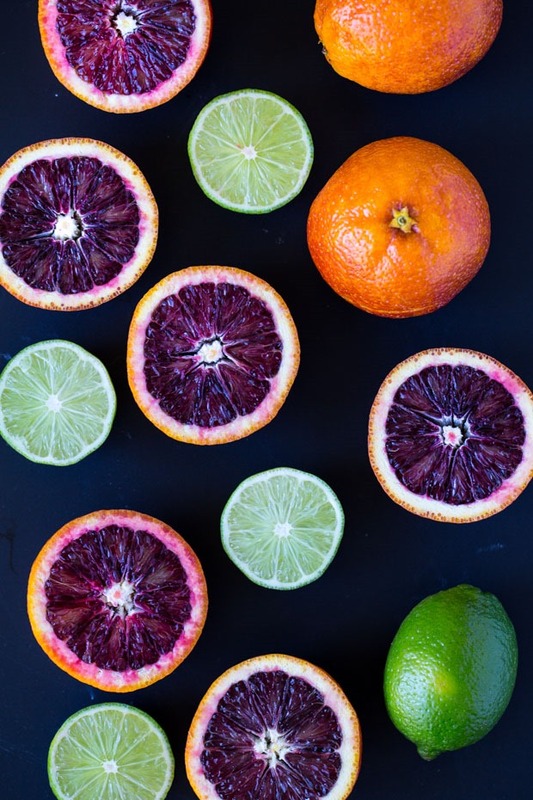 I seriously need to get some blood oranges. So bright and colorful! Thanks for sharing! This is an awesome twist on a margarita! I keep seeing blood oranges on sale at the grocery store I will just have to make some this upcoming weekend.